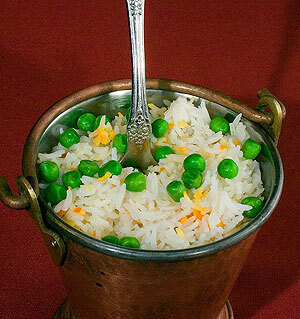 Saffron flavored basmati rice garnished with green peas. Saffron flavored basmati rice with vegetables and nuts. 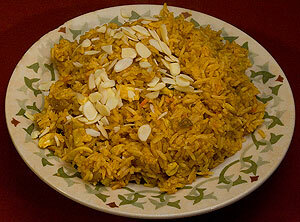 Saffron flavored basmati rice with spiced chicken and nuts. Saffron flavored basmati rice with spiced lamb and nuts. Fruits and nuts cooked with rice. Saffron flavored basmati rice with Prawns and nuts. Basmati rice fried with potatoes, egg & green peas.